My wife has the same mold. 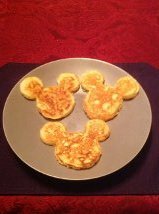 It's always fun for me and the kids when she make us what we like to call "Breakfast Mickeys". Delicious too. Looks yummy! And so much fun!